When I was growing up, I was quite the Chicken McNugget aficionado. Other fast food restaurants had their versions of nuggets, but I liked the McDonald’s version the best — probably because of the mild flavor. I’d dip half of them in ketchup and the other half in honey. Who came up with the idea to serve fried pieces of processed chicken with honey?! It kind of makes my teeth hurt to think about it now. Because I love making meatless versions of foods I enjoyed before I stopped eating meat, I decided to tackle this childhood favorite — and tackle it with sweet potatoes. So no, these are not something you’re going to eat and think, “Oh, these are just like the real thing!” But they do take the shape of the original and the dippability. (Dippability is not a word, but it should be.) The secret to forming nuggets with sweet potatoes is to let the mashed sweet potatoes chill in the fridge for a while before you start working with them. I’ve made several iterations of this recipe, trying to get the nuggets just right and this is the one that works the best — adding the egg to the sweet potatoes helps the nuggets keep their nuggety shape and not fall apart when you’re eating them. With cinnamon and maple syrup, these nuggets are just a little bit sweet and very kid-friendly. If you’re not serving these to kids and you want a bolder flavor, I’ve also made these with sriracha and chipotle seasoning instead, and they tasted great. Half the fun of serving nuggets is having a variety of sauces to dip them in — in this case, instead of honey and ketchup, I’d suggest a simple apple cider reduction for those of you with a sweet tooth and Cranberry Chipotle Ketchup for those of you who want to class things up with something a little fancier. This December, we’re republishing updated recipes from Oh My Veggies’ first year. This post was originally published on March 18, 2011. 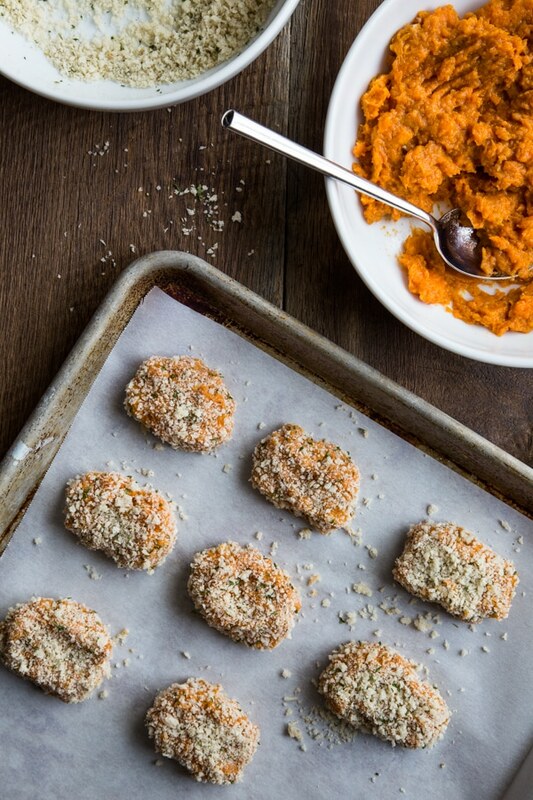 Serve these kid-friendly sweet potato nuggets with your favorite dipping sauces! Pierce the sweet potato in several places with a fork. Place it on a rimmed baking sheet and bake until it’s softened and just beginning to caramelize, 45-60 minutes. Cool potato completely. Discard the skin and transfer the insides of the potato to a small bowl. Mash and refrigerate for at least 2 hours. After the refrigeration period, preheat the oven again to 400ºF. Remove sweet potato from refrigerator. Stir in the cinnamon and maple syrup. Add salt to taste, if desired. Fold in the egg. Pour the panko onto a small plate. Form nugget shapes with the sweet potato mixture (it will be wet, but don’t worry, it will hold together! 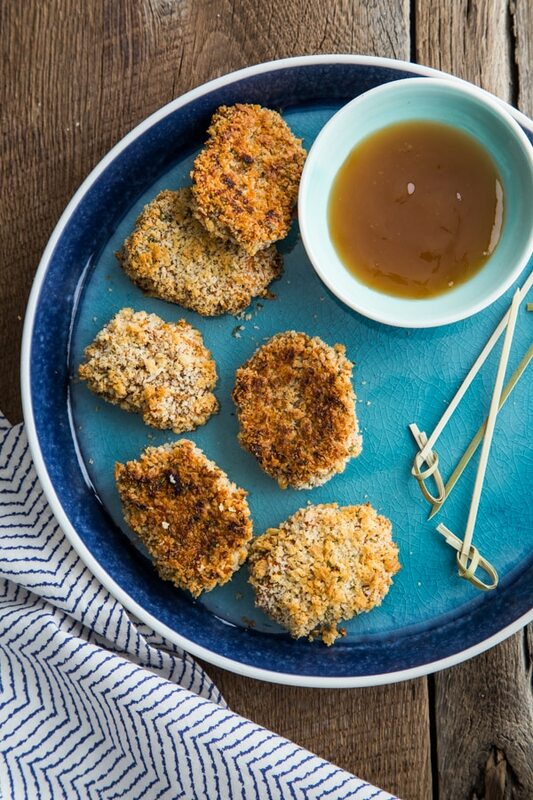 ), coat the nuggets with panko, and place them on a parchment paper-lined baking sheet. If the nuggets are a little messy looking, you can press them into nice shapes on the baking sheet. Spray each side of the nuggets with an oil mister — this is optional, but it helps the exterior get crispy and brown. Bake the nuggets for 15-20 minutes, flipping halfway through cooking time, until they’re golden brown and warmed through. To make a sweet Apple Cider Dipping Sauce, boil 1 cup of refrigerated (not shelf-stable!) apple cider in a small saucepan over high heat until it’s reduced by half. Combine 2 teaspoons of water and 1 teaspoon of cornstarch in a pinch bowl until no lumps remain, then whisk the mixture into the apple cider until thickened. Remove from heat and serve. The prep time includes hands-off time baking the sweet potato and letting it chill in the refrigerator. To reduce this time, bake the sweet potato the day before and let the mashed sweet potato chill overnight. They look so good! Love sweet potatoes, so nuggets would be perfect. That looks and sounds really good!! But, and sorry if this sounds dumb, what is panko and bulgar? I'm so trying this recipe out on my uber picky 17 month old! yum sweet potatos will definitely be trying this recipe. Ever tried sweet potato fries in the oven? NO deep frying and no oil but just like french fries. I wanted to like this, I really did. I’ve loved every other recipe that I’ve tried from this blog and I was determined to like this one too. But something about it just turned me off. The sauce was too bitter, even after I added some brown sugar, and the nuggets themselves just didn’t turn out. They were almost TOO starchy and the texture really threw me off. The taste itself was just… strange. I really expected these to be better, but I will still continue to try other recipes from this blog! Thank you for your feedback. The sauce definitely shouldn’t have been bitter, but I can totally see how the texture of the nuggets with the sweet potato & bulgur together might be an issue for some people. I’m actually working on a version of these for my book without the bulgur and I might update the recipe here too. I’m so sorry they didn’t turn out for you! I love these… and that cranberry chipotle ketchup?!?! YES PLEASE. What would you recommend in place of the eggs? I’m thinking these would be good with a smoky bag sauce. I DO have some leftover cranberry sauce in the fridge that is basically begging for these. BEGGING. such a good idea! i love sweet tators! Oh my goodness, this look amazing! I absolutely have to try this!